Animated: No; Low-poly: No; Materials: Yes; Rigged: No; Textured: Yes; UV Layout: No; 3D File Formats Included: .fbx (multi format), .max (3ds Max), .obj (multi format); Created In: 3ds max 2012; Geometry: Polygons; Poly Count: 134000. Ferrari 458 Italia created in 3dsmax 2012 with VRay materials. Lighting setup is not included in the package. Koenigsegg Agera; Maserati Granturismo 2014; 2014 GMC Sierra 1500 Double Cab; Eurocopter EC135 Police; Eurocopter EC135; Chevrolet Corvette 2014; Audi R8 2014. Keywords: auto, coupe, detailed, ferrari, italia, italian, race, red, sport, sportcar, supercar, vehicle, vray. Best stock graphics, design templates, vectors, PhotoShop templates, textures & 3D models from creative professional designers. 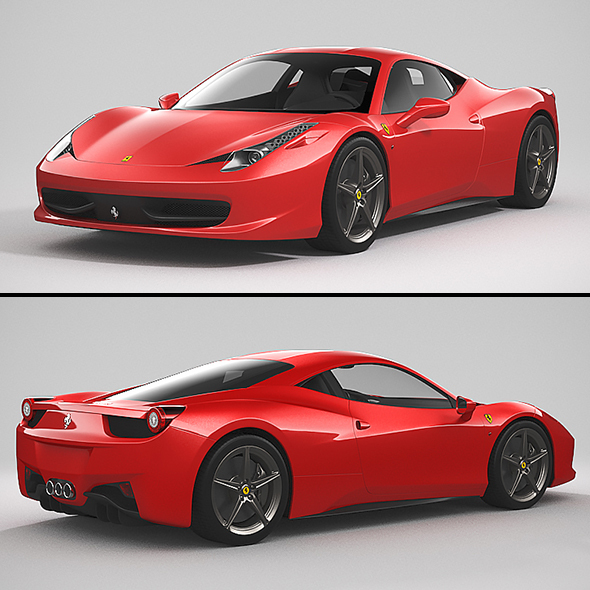 Create 3DOcean Ferrari 458 Italia 20999424 style with PhotoShop, Illustrator, InDesign, 3DS Max, Maya or Cinema 4D. Full details of 3DOcean Ferrari 458 Italia 20999424 for digital design and education. 3DOcean Ferrari 458 Italia 20999424 desigen style information or anything related.